For the minimalist and modern bride seeking a barely-there veil, this sheer fingertip veil gently kisses the shoulders and drops to the fingertips in the most beautiful and flattering way. An effortless, light-as-air veil, the Marisa is effortless in its simplistic appeal. A clean and minimal piece of sheer beauty, it adds the perfect amount of drama. It features no gathers at the comb and a sheer single layer of fine tulle. It sits flat against the head and can be perfectly positioned under bridal headpieces and combs for a seamless and clean finish. Minimalist design for modern wedding dresses. Single tier veil – no blusher layer to pull over your face. Measurements: Fingertip length at approximately 90-100cm. The Marisa wedding veil is ready to ship. Please allow 5-7 business days for processing plus delivery times. Rush orders available for a fee. As this veil can be made to order, please leave your height and heel height measurement at checkout. 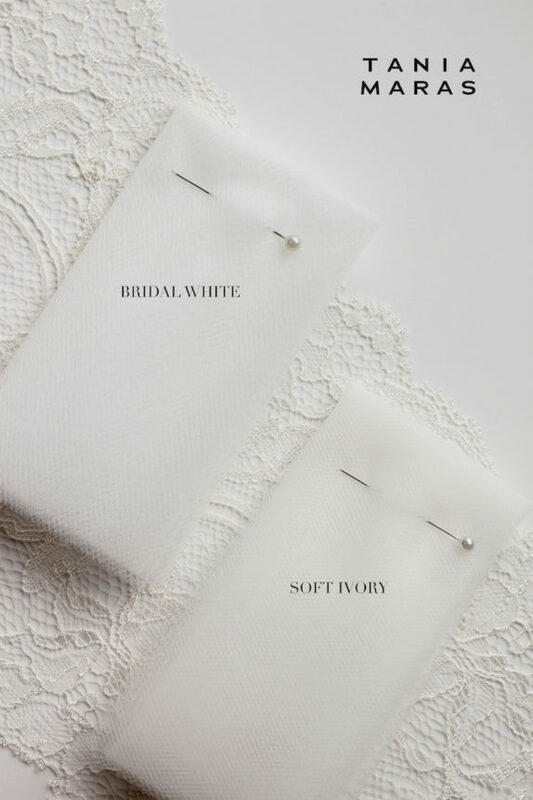 Please also let us know where you intend to position the veil’s comb (at the crown, above a low set bun etc), as this will impact the length of the veil. If you have any questions, please feel free to contact us to discuss! The Marisa sheer fingertip veil is our go-to veil for brides looking for a subtle and ethereal veil for her wedding day. A fingertip length veil is one of the most flattering lengths available as it suits almost all wedding dresses and hairstyles. When it comes to hair, we love to style this veil with all bridal hairstyles including intricate and detailed updos. After all, why go to all that trouble to create that perfect updo only to cover it? Why do we love this veil so much? The single layer of tulle sits beautifully under our headpieces and adds no bulk – perfect for a seamless and effortless finish. Our Marisa veil is a fingertip veil that’s designed to fall to approximately 90-100cm depending on your height. It can be customised to any length to suit you. If you are unsure which length will best suit your wedding dress, please contact us with photos of your wedding dress and height details and we can get back to you with a recommendation. Marisa is handcrafted from a lightweight bridal illusion tulle. It’s available in bridal white or soft ivory tones. We like to aim for a colour match or a shade lighter than your wedding dress.